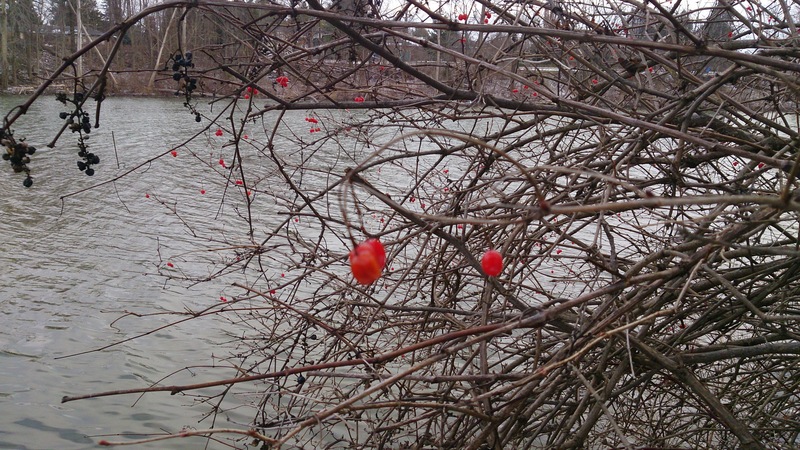 A handful of berries haven’t been stolen away by the birds at the Coldstream Conservation Area. The dead of winter has me pining for summer fruit, available for a good price at the local farmer’s market or better still picked fresh off the bush and eaten immediately. I know there are great frozen options available at this time of year, so this is partly also a yearning for warmer weather, but the truth is nothing compares to summer fruits and vegetables in my books. The flavour of that greenhouse tomato can’t hold a candle to the ones from my garden in August, and those giant California strawberries just make my mouth water for some tiny Ontario berries. So what’s a girl to do? Look on the bright side, I suppose. The fact that we have access to any fresh fruits and vegetables is a blessing, and one that shouldn’t be taken for granted. Whenever there’s concerns or recalls in the grocery aisles, it really makes me appreciate the magnitude of the infrastructure that helps those California strawberries land on a shelf at my local store. My plan then, is to enjoy the apples in my fridge, and start planning for the next crop of rhubarb.